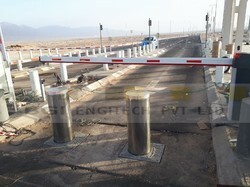 Providing you the best range of anti terror automatic bollard, automatic road bollard, automatic retractable bollards, security bollards, hydraulic bollards and pneumatic bollards with effective & timely delivery. Owing to the rich industry experience, we have been able to bring forth the clients an excellent assortment of Anti Terror Automatic Bollard. Specifically designed to bring a vehicle to the sudden halt, the range rips the tyres apart, at locations where vehicles usually pass at a very high speed, thereby preventing accidents. The range is also incorporated with a set of hollow spikes, which are locked when the barrier is raised and allow safe passage for the vehicles. Our range of highly appreciated and reliable products also includes these Automatic Road Bollard which are truly robust and very tensile. 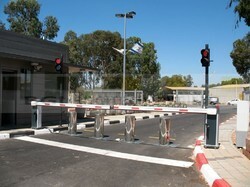 These automatic bollards are mainly used to block the entry of cars and automobiles in the restricted areas. These automatic bollards are very well equipped with all the latest and required facilities for an easy and convenient operation. Suitable for both high-security and traffic control, BGI's B-series bollards have been proven to be durable, reliable and a perfect solution for heavy duty applications. 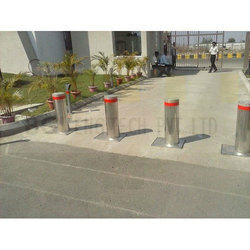 Owing to the rich industry experience, we have been able to bring forth the clients an excellent assortment of Automatic Retractable Bollards. Specifically designed to bring a vehicle to the sudden halt, the range rips the tyres apart, at locations where vehicles usually pass at a very high speed, thereby preventing accidents. The range is also incorporated with a set of hollow spikes, which are locked when the barrier is raised and allow safe passage for the vehicles. With extreme experience in this line of work, we have gained enough expertise in manufacturing, exporting a wide range of Security Bollards. Our range of highly appreciated and reliable products also includes these Security Bollard which is truly robust and very tensile. 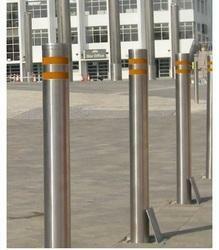 These Security Bollard are mainly used to block the entry of cars and automobiles in the restricted areas. These are very well equipped with all the latest and required facilities for an easy and convenient operation. We are offering Hydraulic Bollards to our client and we assure satisfaction and quality of the product. We are offering Pneumatic Bollards to our client and we assure satisfaction and quality of the product. 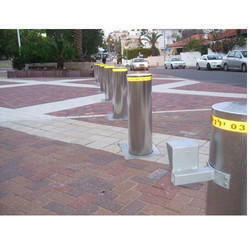 With a wide range of shapes, sizes, and materials, BGI's decorative fixed bollards are a cost-effective and efficient way of marking and protecting a perimeter or traffic line.BGI’s fixed bollards are also ideal for ports and have already been used in the ports of Israel. No welding, no fixing with screws and bolts, and there are no wear and junction points which compromise durability over time and sturdiness. We are offering SS Fixed Bollard to our client and we assure satisfaction and quality of the product. Designed with a simplicity of operation in mind, the B4000 bollards contain a gas-filled piston which automatically raises the bollard and locks it into position when the key is inserted. To lower the bollard, the key is inserted to release the lock and then the steady pressure is applied to the top. When the bollard is fully lowered, it automatically locks in position. Keys for the B4000 series are cut in such a way as to thwart attempts at forcing the bollards closed. The piston is engineered to the highest standards and can easily be removed for maintenance. We are leading manufacturer & supplier of k12 crash rated pneumatic bollard all across the Globe. 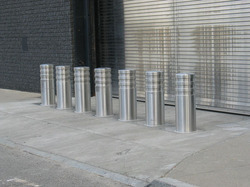 The wide range of bollards offered by BGI provides a cost-effective solution for every site. The automatic, semi-automatic and fixed versions are all engineered to meet international anti-ramming standards. Operated either pneumatically or hydraulically, the B3000 series offers the highest standard of anti-ramming and security protection. Taking as little as 2 seconds to reach the fully raised position, these bollards can be used in the most demanding locations where high-volume traffic flows must be managed. The B3000 bollards are often combined with light arm barriers to providing maximum deterrence and safety. With a hard-wearing stainless steel finish, the bollards are engineered to meet the DOS and PAS standards for anti-ramming and are used extensively to protect sensitive government and military locations as well as civilian compounds. When powered by BGI's innovative pneumatic system, the bollards can be operated at very high speeds and when combined with a light arm, the air pressure can be used to simply and accurately synchronize with other elements in the system. The use of air pressure also significantly reduces the wear and tear on the components and provides years of maintenance-free use. We are offering K4 Crash Rated Pneumatic Bollard to our client and we assure satisfaction and quality of the product. We are offering K4 Crash Rated Hydraulic Bollard to our client and we assure satisfaction and quality of the product. We are offering K8 Crash Rated Hydraulic Bollard to our client and we assure satisfaction and quality of the product. We are offering K8 Crash Rated Pneumatic Bollard to our client and we assure satisfaction and quality of the product. 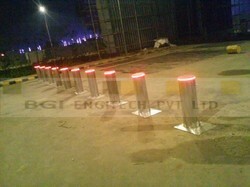 We are offering K12 Crash Rated Hydraulic Bollard to our client and we assure satisfaction and quality of the product. With a wide range of shapes, sizes, and materials, BGI's decorative fixed bollards are a cost-effective and efficient way of marking and protecting a perimeter or traffic line. We are leading manufacturer & supplier of Electro Mechanical Bollard all across the Globe. 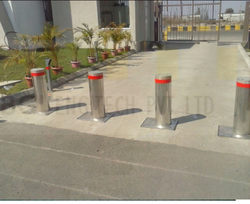 We are leading manufacturer & supplier of Blocking Bollard all across the Globe. We are leading manufacturer & supplier of Rising Bollard all across the Globe. 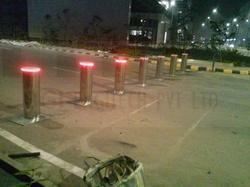 We are leading manufacturer & supplier of Security Rising Bollard all across the Globe. We are offering Automatic Pneumatic Bollard to our client and we assure satisfaction and quality of the product. 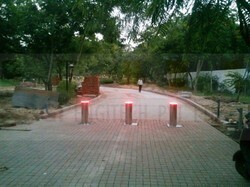 We are offering Traffic Bollard to our client and we assure satisfaction and quality of the product.